It’s fun to get gifts, but wrapping them especially if you have sore or weak hands can be hard. 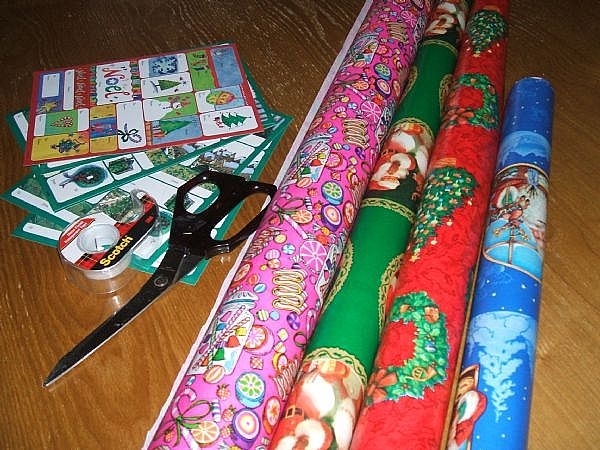 Here are a few tips to help you wrap Christmas gifts easily. Try to spread your gift wrapping over a period of time, instead of trying to get it all done in one night. 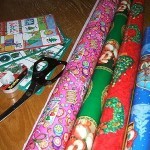 This way you can wrap one or two gifts at a time and that will help greatly if you get sore hands from arthritis. Consider investing in 3M scotch tape dispensers. You can pick one up at any office supply store. These are weighted and sit on the desk to keep you from having to fumble with tape. You can get a piece of tape with one hand quickly and easily. They are also not expensive – anywhere between five and ten dollars. Use gift bags whenever possible. Gift bags are great, and you can find a large assortment at any discount or dollar store. They are inexpensive and easy to use. I usually wrap the gift in a sheet of tissue paper, but you don’t have to, just put the item at the bottom, then top with a few sheets of tissue paper and you’re done! No tape, no wrapping paper, it’s easy and quick. Instead of topping off your gift with ribbon, which can be a hassle to tie and such, use those great sticky star bows you can get in a large package. They peel and stick and look so pretty. Don’t be afraid to ask for some help, my mom used to let us help her with Christmas gifts- she would wrap and we would stick the little star on, and hand her the tape. It will help you and create some memories for you and the kids or hubby. Have fun gift wrapping and remember it’s not the wrapping, but the gift and thought that counts! This year I ordered all my gifts on line from places that did gift-wrapping and had them delivered straight to my family and friends so I didn’t have to worry about final posting dates or how to get gifts to people I wasn’t going to see. It cost a bit more than doing it myself but the time and stress it saved were astronomical. celebration….. two during Christmas ! our research and friends with our illness. THANKS. PEACE ! I love all of the great tips. I don’t have Scleroderma; but my 21-yr. old granddaughter does. However, we can all use these neat tips, some of which I already carry out. With lymphoma, there may be a time when I won’t be able to wrap gifts either. All of my family saves the gift bags and gift boxes to uses the next year(and the next, and the next), I saw one box from my sister-in-law’s mother that was probably 15 yrs old. We were green before it was cool, I guess. I liked the weighted tape dispenser idea so much I bought one right away! We also use paper gift bags but I love the idea of the fabric ones- I’ll definitely check out the link! Our family uses a lot of gift bags. The receiver of the gift will save the bag and pass it along with one of the next gifts they “wrap”. This cuts cost’s and makes it much easier! Great tips Gals! I am always stuck doing all the wrapping. This year I am using all bags. p.s. A Pet rabbot named “STEW” so funny! Another way to solve this is to go eco-friendly. You can use scarves, squares of cloth (with edges hemmed/trimmed festively), pretty dishtowels, etc. Then use a lace ribbon, necktie, etc to tie things us. You can also get reusable items through http://emeraldplanet.ca. I’ve tried their products and am very happy with them. I like using reusable cloth bags. They are green and easy! At home there is just my Hubby and I and our 2 fur babies (Boo our Dog and Stew our Rabbit). What I have done is to decorate some Christmas Themed gift boxes (you can get these for about $2 each at discount stores and chain stores like K-mart etc) and I decorate them with pretty material ribbons and bows and curling ribbons and Christmas picks and gift tags on the outside (we write on the gift tags), on the insde we have shredded cellophane or strip tinsel etc.